Organizations Investing in Big Data, Cloud and Mobility are Growing up to 53% Faster than Laggards | What's The Big Data? Investing in the latest IT tools correlates with higher growth rates. The midsize organizations actively using big data, cloud and mobility, enjoy up to 53% higher revenue growth than those that have not invested in these technologies. The study found multiple benefits derived from these investments, including improved efficiency from as a result of investing in mobility (39%) cost savings (42%) and getting things done faster (40%) for cloud, and better targeting of marketing efforts (41%) for big data. Bimodal IT, according to Gartner, is “the practice of managing two separate, coherent modes of IT delivery, one focused on stability and the other on agility.” A recent Gartner survey of more than 2,900 CIOs found that 40% are already on the bimodal journey, with the majority of the remainder planning to follow in the next three years. 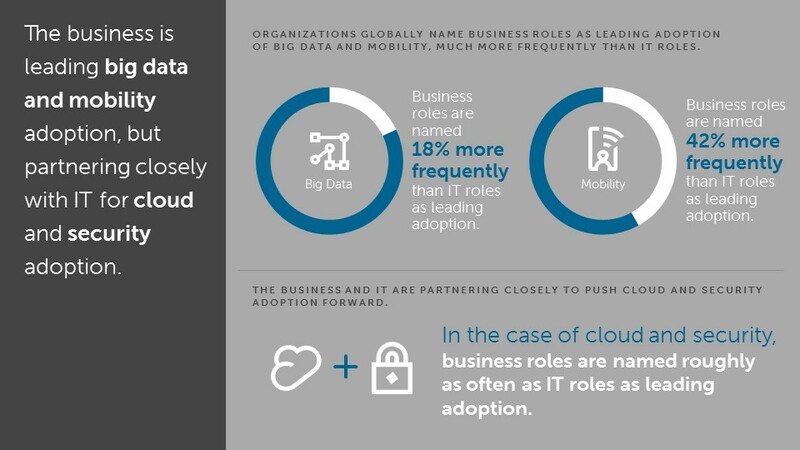 Similarly, the Dell study found that business teams are leading the adoption of big data (18%) and mobility (42%) much more frequently than IT teams . However, business and IT teams are equally likely to lead adoption of cloud and security , suggesting these teams partner more closely on these initiatives. While 42% of the organizations surveyed understand the benefits of big data, 44% don’t know how to approach it . Cost is the biggest obstacle for organizations not yet using big data but also for those currently using it. In North America, however, 69% of organizations think they are talking advantage of big data and 73% (up from 54% in 2014) believe they have big data that can be analyzed. 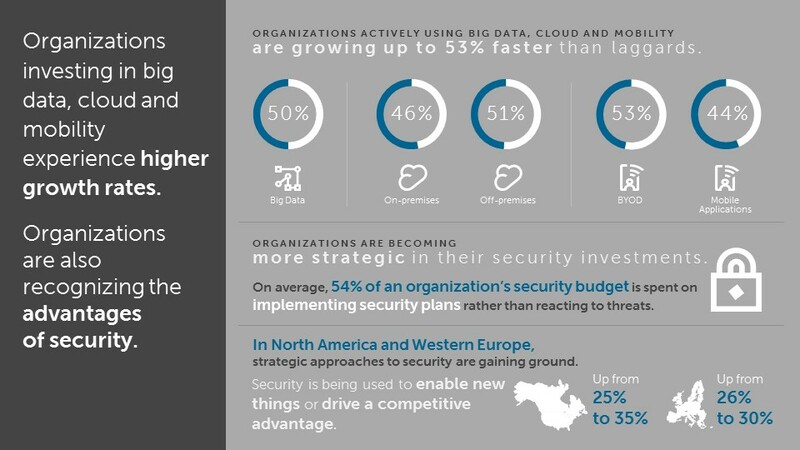 Security is being used to enable new activities or drive a competitive advantage, up from 25% to 35% in North America and up from 26% to 30% in Western Europe. Organizations with ‘better security’ as a business goal are more likely to have security plans in place for some or all types of security incidents (69% versus 58% of organizations where ‘better security’ is not a business goal). Across the companies surveyed, 54% of the security budget is spent on implementing security plans rather than simply reacting to threats. 77% of organizations cited the ability to more quickly respond to market conditions as the key benefit of investing in security. However, below the $100,000 IT annual spend level, fewer than one in five organizations have comprehensive security plans. And below the $10,000 IT annual spend level, nearly one in five companies have no security policies at all —not even informal guidelines. Across all the organizations surveyed, security concerns are the number one barrier to mobility expansion, and the biggest barrier to adoption of public clouds (44%) and SaaS (38%). This entry was posted in Big Data Analytics, Cloud Computing, IT, IT industry, Mobile, Security and tagged Dell, IT laggards, IT Leaders. Bookmark the permalink.